It's time for new releases here at Paper Sweeties! And look at this GORGEOUS photo inspiration! I was inspired by everything as you can see in my card! I used the new Home Grown Sweet Cuts to make the pumpkins! They are apples... I just cut off the leaf and stem! I did a little mixed media detail to this card. The pumpkins were embossed with a Tim Holtz stencil and Crackled Paste. And the background panel was embossed with another Tim Holtz stencil and embossing paste. Then everything was sponged with Distress inks. I really, really hope you will join in the fun with us this month!!!! You could be our next Guest Designer or win a gift certificate from the Paper Sweeties Boutique! Mackie Robertson <– you are here! WOW! Mackie, this card is amazingly beautiful! You have such a wonderful talent! 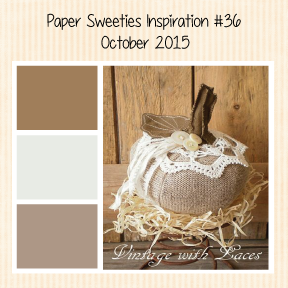 Love the textured apple "pumpkins" with the burlap leaves and the way you colored the pumpkins and banner is gorgeous! Oh wow... this is gorgeous! I love all the burlap die cuts I'm seeing..do you have to add a backing to the burlap before you cut it? Mackie I am in love with this gorgeous card! Those pumpkins are swoon worthy with the gorgeous texture and design! Such a fantastic take on the inspiration!!! Those textured pumpkins are so gorgeous, Mackie!!! Beautiful leaves and banner sentiment, too!!! Fabulous take on the challenge! Oh Mackie! What a fabulous textural interpretation of the inspiration - just gorgeous! How pretty Mackie!! I like your layers and texture. Those burlap leaves are splendid! Wow..those pumpkins are amazing..what a gorgeous card! Mackie this is gorgeous! Love,love the pumpkins!